Father’s Day is meant to be spent with dads, the human, animal and prehistoric kind. 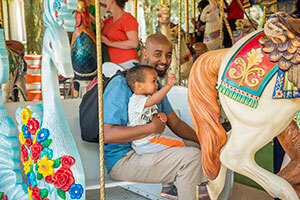 Enjoy a fun-filled day at the Zoo, on Father’s Day presented by Prairie Farms Dairy, Sunday, June 17. All dads receive free admission, no coupon necessary. Hang out on the wild side and stop in the U.S. Bank Gathering Place, to sample Prairie Farm Dairy products, while supplies last. Giraffe dad, Bahatika, has fathered four calves; two males, Tafari and Kazi; and two females, Zola and Maya. He welcomed his most recent calf, Maya, on May 15, with mother, Marlee. Male giraffes, known as bulls, can be up to 18 feet tall, three times the average height of a human dad! 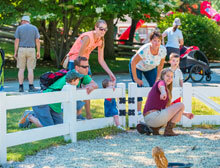 Give dad a unique experience, visit the Zoo’s special exhibit, Dinosaurs! A Jurassic Journey, sponsored by Sendik’s Food Markets. Dad will have the chance to get up-close and personal with over 20 of the Zoo’s prehistoric residents. Get too close and some of our dinosaurs may spit, don’t worry it’s just water! See the heaviest dinosaur to have roamed the earth, the Brachiosaurus or long-necked dinosaur, weighing the same as 17 African elephants. The dinosaur exhibit is just $3 after regular Zoo admission. A trip to the Zoo on Father’s Day would not be complete without seeing dad’s favorite animal, whichever one that is! The Zoo is open from 9 a.m. to 5 p.m. on Father’s Day, presented by Prairie Farms Dairy. For more information, contact the Zoo at 414.771.3040.